THE MURMAIDS-WHAT MIGHT HAVE BEEN? Sadly, musical history is littered with groups that are remembered as one-hit wonders. Their brush with commercial success may have been brief, but at least they enjoyed a tantalising taste of what some established groups take for granted. As a result, after a group has enjoyed one hit single, they want another. This comes as no surprise. Commercial success and the fame and money it can sometimes bring, are as powerful as any drug. Once experienced, a group can spend the rest of their career trying to reach the same heights. Sadly, often, they never comes close to enjoying the same success. Part of the problem is that a second hit single always proves to be tantalizingly just out of reach, and the group is destined to be remembered as a one-hit wonder. That was the case with The Murmaids, who had an enviable musical pedigree. Two of The Murmaids, sisters Carol and Terry Fischer, came from a family that was steeped in music. The two previous generations of their family had been involved in the music industry all their lives. This included their grandmother and her three sisters, who had been part of a vaudeville act, The Locus Sisters. However, Carol and Terry Fischer’s parents were also steeped in music. Carl Fischer had been a successful songwriter and arranger who had written You’ve Changed, which was recorded by Billie Holliday. Then during a ten-year period where Carl Fischer was Frankie Laine’s musical director, he wrote the jazz standard We’ll Be Together. Sadly, tragedy struck in 1954 when Carl Fischer died suddenly. With two young daughters to support, Terry Fischer Sr. returned to singing with big bands. That was what Terry Fischer Sr. had been doing when she had first met Carl Fischer. She had sung with various big bands, and became the first female vocalist in Stan Kenton’s Orchestra. Now after the tragic death of her husband, Terry Fischer Sr. was back singing in the big bands. She was a talented vocalist and managed to pickup where she had left off. Little did Terry Fischer Sr. know that soon, a third generation of her family would be embarking upon a musical career. However, with such a strong musical pedigree, it was almost inevitable that Carol and Terry Fischer would embark upon a career in music. Music was family business. Terry Fischer Sr. encouraged and supported her daughters, who were proving to be talented singers. They were active in their school’s glee club, and by high school, were music majors. It was around this time, that Carol and Terry met a young songwriter and producer, Mike Postil. The future Mike Post had just graduated from Los Angeles University High, and had written some songs. Once he had recorded these songs, he would shop them around town. There was a problem though, Mike Post had nobody to sing backing vocals on his demos. By 1963, Carol Fischer who was fifteen, and Terry Fischer who was seventeen, were living in Los Angeles. For some time, the sisters had been singing with seventeen year old Sally Gordon, who was a friend and neighbour. With Terry Fischer Sr’s help, they were a polished and professional trio. This was what Mike Post was looking for. When Mike Post met Carol, Terry and Sally, he knew that he had the backing vocalists that he had been looking for. They sang backing vocals on demos for producer Mike Post. Sometimes, Mike Post would bring them in to add backing vocals on some of his productions at Gold Star Studios. That was where Kim Fowley first came across the trio. By 1963, producer and songwriter Kim Fowley, who was another alumni of Los Angeles University High, was working at Gold Star Studios as an in-house producer. He had already enjoyed hits with Nut Rocker and Alley Oop. However, the twenty-four year old was keen to forge a career as a producer. That was why he had taken the job at Gold Star Studios. That was also where Kim Fowley first heard the trio sing. Realising that they were talented, he offered to record them. This was the break the trio had been looking for, and they jumped at what could be a once in a lifetime opportunity. The trio’s first recording session with Kim Fowley was hardly a resounding success. He had them record a version of Alley Oop, but the song didn’t work. Despite that, Kim Fowley wasn’t going to give-up on the trio. Fortunately, Kim Fowley encountered a talented, but as yet, unknown singer-songwriter, David Gates. The future founder of Bread was driving along one day, when he saw a hitchhiker. Curiosity got the better of David Gates. He stopped and picked up Kim Fowley. Soon, the two men got talking, and Kim Fowley volunteered that he was a producer. David Gates told him he was a songwriter, and had written a song for a girl group. He reached into the back seat, and produced a guitar, and proceeded to play Kim Fowley Popsicles and Icicles. When Kim Fowley heard the song, he had David Gates send him a demo, as he had someone in mind for the song. Originally, Kim Fowley felt Popsicles and Icicles would be perfect for Skip Battin, who previously, had been one half of Skip and Flip. However, Skip Battin passed on the song. It was only Kim Fowley remembered the trio he had recorded at Gold Star Studios. Kim Fowley even had a label lined up for the song. This was Chattahoochee Records, an imprint of Conte Records. It had been formed by Ruth Conte Yardum, with the help of Kim Fowley. Originally, it was to release singles by actor-singer John Conte. However, Conte Records had a pop imprint, Chattahoochee, which Kim Fowley owned a share in. This was the label Kim Fowley planned to release Popsicles and Icicles on. All he had to do was firstly to convince Ruth Conte Yardum about the merits of his masterplan, and then convince Terry Fischer Sr. that this was the right song for her singing trio. Eventually, Kim Fowley managed to convince Ruth Conte Yardum that Popsicles and Icicles had the potential to be a hit, and that he could record the single for $100 using three high school students. Now Kim Fowley’s only potential obstacle was Terry Fischer Sr. He had to win her over, and her that Popsicles and Icicles had the potential to be a hit. Only then, could Kim Fowley book time at Gold Star Studios. Now he could concentrate on recording the trio’s debut single. However, the trio needed a name. When the trio arrived at Gold Star Studios, they were now called The Murmaids. Terry Fischer was The Murmaids’ lead singer, and Carol and Sally would add harmonies. The Murmaids were shown the five tracks that Kim Fowley wanted them to record. This included Blue Dress, Bunny Stomp, Comedy and Tragedy and Huntington Flats. However, one track stood head and shoulders above the rest, the David Gates’ penned Popsicles and Icicles. Given that funds were limited, it was always going to be touch and go whether The Murmaids could record two tracks in the time allotted. They managed to record Popsicles and Icicles but there was no time left to record a B-Side. This didn’t faze Kim Fowley. Once Kim Fowley tallied up the costs, it came to $108. He hadn’t quite recorded the single for the $100 he had predicted. However, he was convinced he had a hit on his hands. That was despite not having recorded a B-Side. So Popsicles and Icicles was paired with a surf styled instrumental Bunny Stomp and released in late 1963. 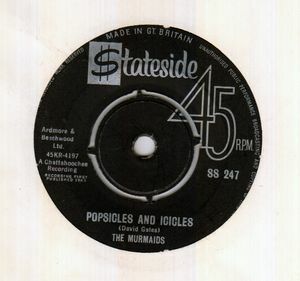 When Popsicles and Icicles was released in early November 1963, straight away, The Murmaids’ debut single was being played on the radio. From 119 in the US Billboard 100 on 9th November 1963, Popsicles and Icicles reached sixteen by the 16th November 1963. Eventually, in the charts of 11th December 1963, Popsicles and Icicles peaked at number three on the US Billboard and Cash Box charts. However, in Record World, Popsicles and Icicles reached number one. Little did The Murmaids realise that Popsicles and Icicles would become their only hit single, and they had just joined the ranks of the one-hit wonders. For their sophomore single, another David Gates’ composition was chosen, Heartbreak Ahead. On the flip side was He’s Good To Me. Kim Fowley wasn’t going to let the record buying public forget The Murmaids, so released Heartbreak Ahead on Chattahoochee Records whilst Popsicles and Icicles was still in the top thirty. This backfired on Kim Fowley, and Heartbreak Ahead stalled at 116 in the US Billboard 100. After two weeks, at 116 in the US Billboard 100 it was a case of Heartbreak Ahead for The Murmaids. They were on a roller coaster. Their debut single reached number three in the US Billboard 100, but the followup failed commercially. There was nothing wrong with the song. The Murmaids brought the lyrics to life. Much of the blame lay can be laid at aspiring pop impresario, Kim Fowley’s door. Heartbreak Ahead was released far too soon, and Suddenly The Murmaids had two singles competing for radio play. Three if The Lady Bugs’ cover of How Do You Do It was counted. Rather than concentrate his efforts on getting The Murmaids career back on track, Kim Fowley had Carol and Terry Fischer record How Do You Do It with Jackie DeShannon. How Do You Do It had given Gerry and The Pacemakers a number one single. The Lady Bugs version was released in February 1964, but failed to make an impression on the charts. This was a worrying trend. Later in 1964, The Murmaids released their third single, Wild And Wonderful. It came from the pen of the Brill Building songwriting team of Ben Raleigh and Barkan. They had just written Lesley Gore’s She’s A Fool. For the B-Side, Sam Friedman’s Bull Talk. These two tracks were supposed to get The Murmaids’ career back on track. On its release, Wild And Wonderful never came close to troubling the charts. Wild And Wonderful became The Murmaids’ second single that had failed to chart. Things weren’t looking good for The Murmaids. 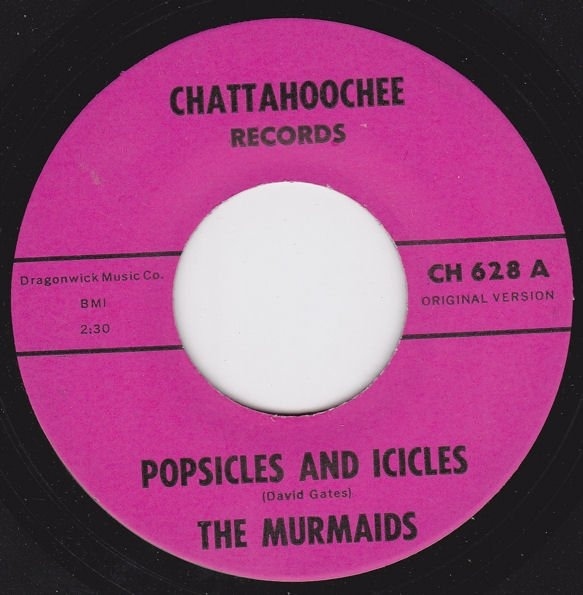 After the success of Popsicles and Icicles, major record labels came knocking on The Murmaids’ door and wanting to buy out their contract with Chattahoochee. Terry Fischer Sr. who was managing the group’s career, decided that they should stay to Ruth Conte Yardum and her Chattahoochee Records. That proved to be a huge mistake. As the summer of 1964 drew to a close, Terry Fischer and Sally Gordon were about to leave home, and head to college. They needed the royalties from Popsicles and Icicles to pay their way through college. However, the royalties weren’t forthcoming. 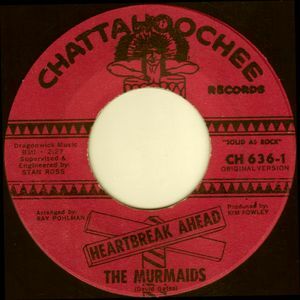 This lead to Chattahoochee Records having to circulate a memo to other record labels explaining why The Murmaids hadn’t been paid. The memo explained that the funds in a trust for each member of The Murmaids. However, Chattahoochee Records alleged that the agreement hadn’t been honoured by Terry Fischer Sr; and claimed that Sally Gordon had received her funds. The label further claimed that Terry Fischer Sr. had stipulated she had the final say over the other two members participation in the group. However, even fifty-one years later, some of Chattahooche Records claims are disputed. 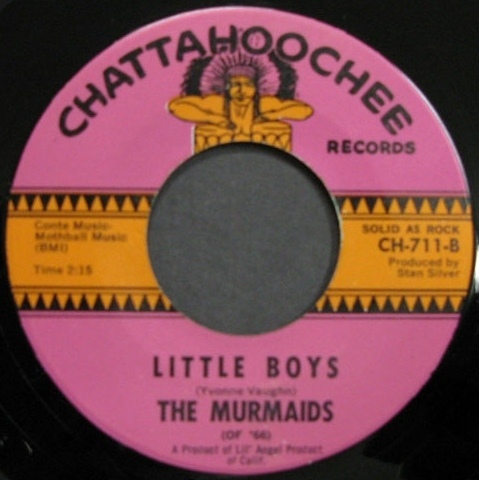 Recently, Terry Fischer claimed that when The Murmaids received their first royalty statement; “it showed that we were owed nothing at all!” The expenses charged by Chattahoochee Records amounted to $10,000, exactly the sum The Murmaids were owed. Further muddying the waters, was Kim Fowley’s claim that The Murmaids were in breach of contract for recording with The Rip Chords. However, their producer Terry Melcher disputes this claim. What was clear, was that all wasn’t well with The Murmaids and Chattahoochee Records. Despite this, Chattahoochee Record decided to reissue Bull Talk. The former B-Side was about to enjoy its moment in the sun. There was a reason for this. Shirley Ellis’ single Name Game was riding high in the charts, and just about to reach the top twenty. By then, teenagers were adding the word “bull” to sentences, so that adults wouldn’t be able to understand what they were saying. Ruth Conte Yardum and Kim Fowley thought they could jump on the “bull” bandwagon, and score a novelty hit. That wasn’t the case. Despite this, ‘aspiring pop impresario’ Kim Fowley had another plan up his sleeve. He decided to repress Popsicles and Icicles. However, he needed a B-Side, so drafted in five new girls who recorded as The Murmaids. They got to sing on the B-Side Comedy and Tragedy, by agreeing to phone a local radio station, and request Popsicles and Icicles. The song that was chosen was played non-stop for a week. However, Comedy and Tragedy wasn’t the only B-Side to the newly reissued Popsicles and Icicles. When Popsicles and Icicles began garnering more radio play, three other versions of the single were pressed. Each had a different B-Side. Bunny Stomp was followed by Huntington Flats and Blue Dress. As as all this unfolded, the “real” Murmaids were “baffled.” Their group had essentially been hijacked by Kim Fowley and Chattahooche Records. Despite this betrayal, incredibly, Terry Fischer and the rest of the Murmaids returned to the studio. With Popsicles and Icicles growing in popularity once again, The Murmaids went into the studio and recorded enough music for an album. However, that album was never released until 1980. To make matters worse, The Murmaids were never paid for the session. That wasn’t the end of The Murmaids saga. Rubbing salt in the real Murmaids’ wound, was that two singles were released baring The Murmaids’ name. Whether any of the original lineup of The Murmaids sung on the two singles is the subject of debate? The first was Stuffed Animals, which featured Little White Lies on the flip side. 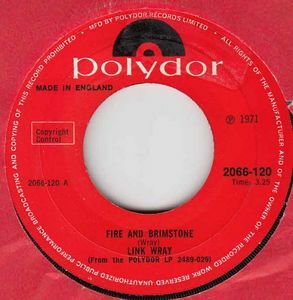 On its release, Little White Lies claims to have been: “Produced and Recorded in Britain by Kim Fowley.” Who sung on the single is still disputed. However, when Stuffed Animals was released as a single, it failed commercially. So did the followup. 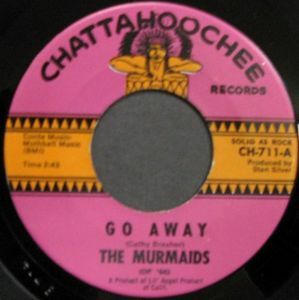 The Cathy Brasher penned Go Away was chosen as The Murmaids’ next single. On the flip side was Little Boys, which Yvonne Vaughan wrote. When Go Away was released in 1966, the single failed to chart. That was all that was heard of The Murmaids until 1968. 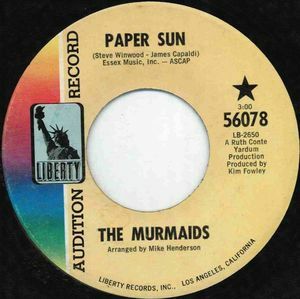 After two years away, The Murmaids returned in 1968 with their swan-song Paper Sun. It was released on Liberty, with Song Through Perception on the B-Side. The only original member of The Murmaids was Sally Gordon. Even she couldn’t revive the group’s flagging fortunes. After five eventful, off and on years, The Murmaids were history. Fast forward to 1980, and The Murmaids Resurface was belatedly released on the Chattahoochee Records. It featured previously unreleased including Don’t Forget, Alone, Three Little Words, Mr. Sandman, Playmates, So Young and You Cheated. At last, the songs The Murmaids had recorded for the album all these years ago, had been released. It was just a pity nobody bothered to tell Terry Fischer about the release of The Murmaids Resurface. Terry Fischer only found out about The Murmaids Resurface when a friend discovered a copy at a record fare in the Mid West. They sent Terry Fischer a copy of The Murmaids Resurface. When Terry Fischer looked at the credits to The Murmaids Resurface the producer was Ruth Conte. This was just the latest twist to The Murmaids story. Seventeen years after they first signed to Chattahooche Records, The Murmaids was proving to be the gift that kept on giving. That wasn’t the case for Terry Fischer and the other two Murmaids. Even today, they’ve no idea of how many records they really sold. That is somewhat ironic. After the commercial success of Popsicles And Icicles, major labels were knocking on Terry Fischer Sr’s door wanting to buy The Murmaids’ contract out, and sign them to their label. Terry Fischer Sr. decided to stay loyal to the label that gave The Murmaids’ their break. Sadly, that proved to be a huge mistake. If The Murmaids had signed to a major, they could’ve enjoyed a much more successful career. They wouldn’t be remembered as a one-hit wonder. The Murmaids, a talented trio, deserved much better. Certainly much better than happened next. Less than a year later after spurning the advances of major labels, The Murmaids never received the royalties they were owed. This couldn’t have come at a worse time, as Terry and Sally Gordon were about to head off to college. By then, The Murmaids’ story was almost at an end. It had lasted around six months. During that period, The Murmaids had played live a few times, and made a couple of appearances on television. After six months, The Murmaids’ story was all but over. That’s despite singles being released for another four years. These singles were either songs the original lineup of The Murmaids recorded, or different lineups put together by musical ‘impresario’ Kim Fowley. 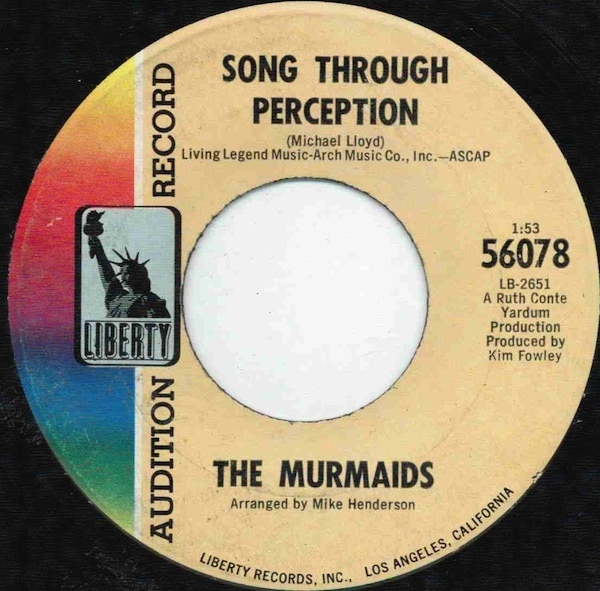 The only other time Terry Fischer entered a recording studio as a Murmaid, was to record The Murmaids Resurface, which was belatedly issued in 1980. By then, The Murmaids had long joined the one-hit wonder club. While the one-hit wonder club may not be the most exclusive club in the world, at least The Murmaids enjoyed a brief, but tantalising taste of fame and commercial success. Although it didn’t last long, nor proved particularly profitable, at least The Murmaids enjoyed their moment in the spotlight, and enjoyed what every band dreams of, a hit single. ← FUZZY HASKINS-THE WESTBOUND YEARS.